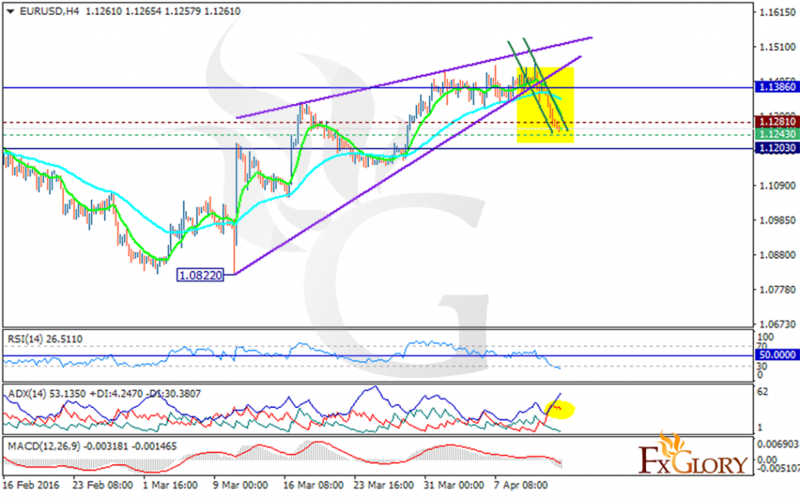 EUR was weakened by the Industrial Production report which was out of Eurozone expectations. On the other hand, FED’s actions are leaving positive impact on USD. Furthermore, the chart has created a rising wedge pattern therefore EURUSD will stay bearish at the moment falling down the descendant channel. The pair is finding support at 1.12430 with resistance at 1.12810 both below the weekly pivot point at 1.13860 and above the monthly pivot point at 1.12030. The EMA of 10 is below the EMA of 50. The MACD indicator is in negative territory signaling the price fall along with the RSI which is below the 50 level confirming the same trend. Moreover the ADX is showing that sellers are stronger than buyers. After the support level breakthrough further decline will be expected targeting the monthly pivot point at 1.12030.